Stung by a remarkable fightback from West Indies on the final day of the rain-hit second Test, India will have to look at their bowling combinations and get back to winning ways when the third Test begins on 9 August. Riding on rookie batsman Roston Chase's resolute 137 off 269 balls, West Indies held on with a fighting draw in the rain-affected second Test in Jamaica. But the visitors still hold a 1-0 lead in the four-match series after winning the first Test in Antigua by an innings and 92 runs and would look to seal the series when they take the field at the Darren Sammy stadium. 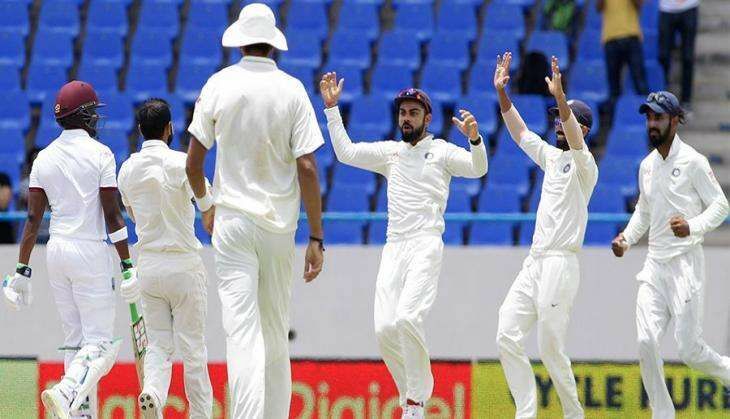 As such, India's ploy of playing five bowlers should stay untouched but it can be assumed that they ought to have discussed the lines bowled at the West Indies' batsmen and why they couldn't take six wickets on a day five pitch in Jamaica. Even so, with the team still enjoying a series lead, it is tough to anticipate any changes in the pacers' quota. However, the one change that can come about is regarding the second spinner slot. Amit Mishra's performance on day five was a huge let down, as he was unable to bowl a holding line and instead leaked runs. With the pitch easing up and the ball going soft, it had a major impact on the skipper's plan to bowl his spinners in tandem. This change-over in the playing eleven will not hurt the balance much, particularly in terms of batting, as Jadeja is a better lower-order batsman than Mishra. Moreover, as a spinner who looks to make the batsmen play at all times, he can play great foil to both pacers looking to stop runs, or bowl in tandem with Ashwin. There is also a remote chance that the team management might go in with three spinners, leaving out Yadav and bringing in Jadeja, considering the dryness of the pitch and the small matter of the ball going soft in the previous Test in somewhat similar conditions. However, rain showers frequent St.Lucia at this time of the year, and it turns cloudy quite quickly here. Even the forecast during the Test is of cloudy conditions and rain on atleast two days. While the Indian team management showed amply in Jamaica that they do not take tropical storms into consideration for their strategic decisions, let alone weather forecasts, yet prevalent conditions here could still sway them from dropping the third seamer. While there could be different permutations and combinations as regards to the bowling attack, India's batting line-up looks set once again. Perhaps the only matter worth pondering over is about the fitness of Murali Vijay. And while the Tamil Nadu opener is slowly regaining full fitness, he didn't bat against the pacers in the nets on Sunday. He faced slow throw-downs and batted against the spinners mostly, that too in tandem with Cheteshwar Pujara. That left KL Rahul and Shikhar Dhawan to work on their pairing as Ishant and Mohammed Shami used new balls in the nets against the opening duo. Perhaps the biggest indicator of Vijay's unavailability was the fact that he was absent from slip catching, whilst Dhawan, Kohli and Rahul worked with the fielding coach Abhay Sharma. In parallel, there is no indecisiveness on the part of the hosts West Indies as regards their opening combination. Shai Hope is expected to make his Test comeback, after the selectors left out Rajendra Chandrika. The former had scored an unbeaten hundred against the visitors in their first tour game in St.Kitts, and skipper Jason Holder will want him to replicate the same. A weak top-order is severely ailing the West Indies after they looked to make progress with both their lower-order partnerships and bowling in the second Test. Given the still-existing gulf in quality and experience between the two sides, snatching that fighting draw at Sabina Park was a huge morale booster for them. The question is, if they can maintain this momentum, replicate that form, and once again prevent India from taking an unassailable 2-0 lead? India: Virat Kohli (c), Murali Vijay, Shikhar Dhawan, KL Rahul, Cheteshwar Pujara, Ajinkya Rahane, Rohit Sharma, Wriddhiman Saha (wk), R Ashwin, Amit Mishra, Ravindra Jadeja, Stuart Binny, Bhuvneshwar Kumar, Mohd.Shami, Shardul Thakur, Umesh Yadav, Ishant Sharma. West Indies: Jason Holder (c), Kraigg Brathwaite, Shai Hope, Darren Bravo, Marlon Samuels, Jermaine Blackwood, Roston Chase, Leon Johnson, Shane Dowrich (wk), Devendra Bishoo, Carlos Brathwaite, Shannon Gabriel, Miguel Cummins, Alzarri Joseph.